If you ever tried running, you probably have experienced that feeling when this person comes up from behind, passes you out, and you wonder how they do it. It looks as if they were not touching the ground at all. They seem to float by, defying gravity – while you are struggling to put one foot in front of another. Ok. Maybe it’s an age thing. At least in my case. Comparing my fitness level with that of a 20 or 30 something year old just doesn’t make sense. At least that’s what I’m telling myself when it happens. Even if that person passing me out is pushing a buggy. But today, I experienced the ultimate insult. Two fully dressed lads just flashed by. I could hardly see them, they were that fast! And, as it turned out, they were not even ‘running’ – they were just trying to catch a bus! I’m not giving up. I’ve set my eye on the Hamburg and Dublin marathons next year and will just keep trying. I won’t win them, but arriving in one piece would be nice. I’m doing it because I want to show Pádraig that he is not the only one who is trying really hard on that long, long road to recovery. 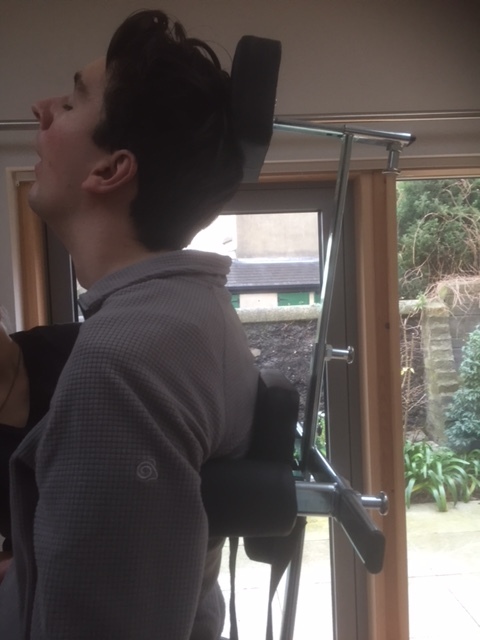 Today, he had a brilliant session in the standing frame when he held, for the first time, his head and upper body straight with just some back support. This afternoon, in the pool, he did brilliant leg work both on his back and when walking across the pool, in addition to showing really good hand and arm control when pulling and pushing himself towards and away from the side of the pool while holding on to the side rail. There is no doubt in my mind that Pádraig will be walking one day, maybe in 2018. Because he just won’t take no for answer and the very concept of something not being possible has never entered his mind. What an example to follow.